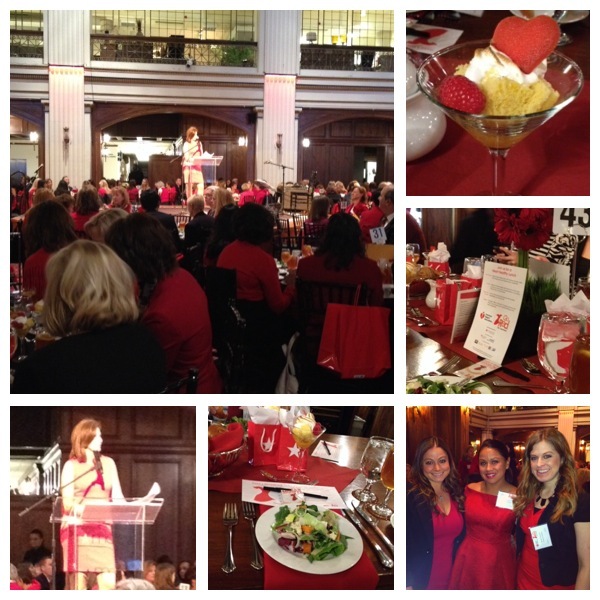 Each year, Macy’s hosts a Go Red for Women luncheon at locations across the country to raise awareness of Heart Disease. Despite being the most fatal disease for women in the United States, Heart Disease isn’t discussed as often as other fatal, yet less prevalent diseases like cancer. Home Run Inn, a client of Envisionit, has been a proud Chicago Sponsor of the event for several years. They were kind enough to invite me and a few other Envisionit women to attend the event with their lovely ladies: Renee Storie, Jamie Wagner, and Nicolette Reynolds. As we arrived on the 7th floor of Macy’s on State Street, we were amazed by all the women in RED. I mean WOW! These women really took this message to heart – their outfits represented every shade of red. Seeing the unity of these women to raise awareness and money for Heart Disease was truly inspirational. Then, the silent purse auction started. Yes, that’s right ladies. PURSE AUCTION! Many sponsors and participants had donated purses of all sizes, colors, and shapes – many of them even stuffed them with goodies such as gift cards, makeup and accessories. The luncheon itself was held in their famous Walnut Room. This was a beautiful setting and we had great company! Speakers such as Sharon O’Keefe, President, University of Chicago Medicine; and Kathy Brock, ABC 7 Chicago News Anchor shared stories of women they knew who had succumbed to Heart Disease. They also played a video of two sisters who found out that they were at risk for Heart Disease just two days apart, and their journey to fight and overcome it. During the luncheon, we all had the opportunity to give a gift to the cause. With each donation, Macy’s gave away beautiful red scarves. Looking around our table, I noticed that all of the Home Run Inn ladies had a red scarf on. Each had personally donated to the cause on top of their corporate sponsorship! We were so excited to support such a great cause with such great women.